A springy hue, fun print, and a tiered, babydoll fit.. what more could we ask for?! 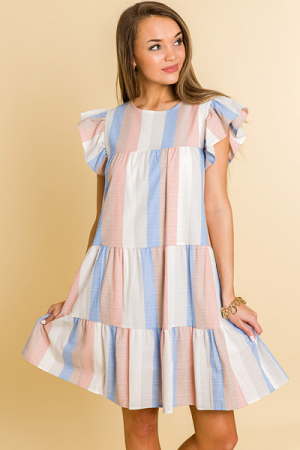 100% rayon fabric is lightweight and easy, and dress is fully lined with a button neck closure. Fit is true to size, if not a bit generous. Model is wearing size small. Shoulder to hem measures approximately: S- 33" M- 33.5" L- 34"